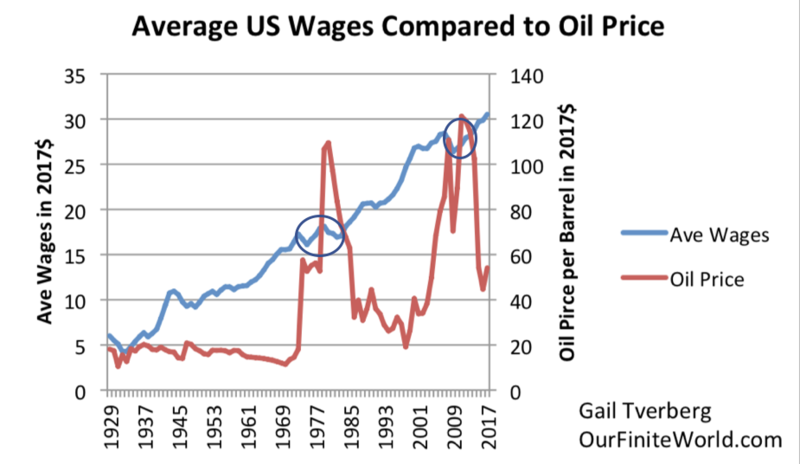 In my opinion, we should be more concerned about low oil prices than high because we live in a world economy with huge debt bubbles. Debt bubbles are part of what enable today's high employment. Debt bubbles support employers that are close to the edge financially; they also support buyers who would not be able afford automobiles or college educations, if loans were to become more expensive because of higher interest rates. Employment in the affected industries would be cut back, leading to recession. Because of these issues, pricking the debt bubble is likely to lead to a major recession and, indirectly, lower energy prices, as in late 2008 (Exhibit 12). 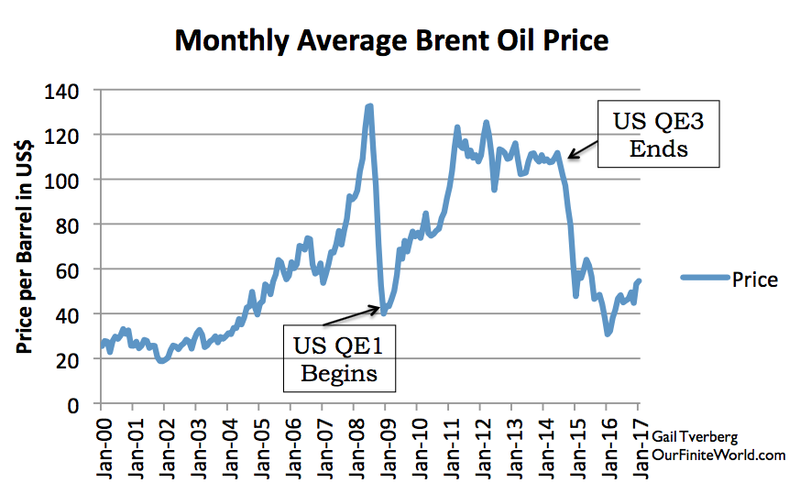 These lower prices are not good news because energy providers of all kinds need fairly high energy prices to survive–probably equivalent to oil at $80 per barrel or higher. If energy prices stay persistently low, the world is likely to see much lower oil supply, in part because oil exporters need the tax revenue that they obtain from high-priced oil to fund their programs. 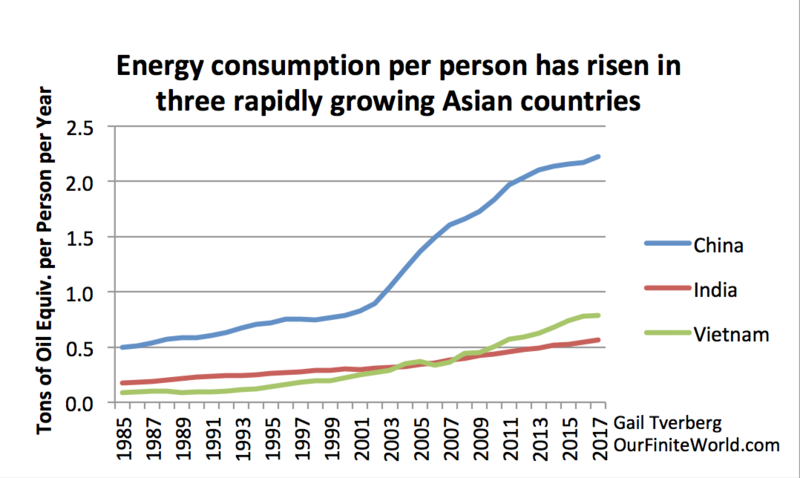 A falling supply of energy consumption per capita tends to make jobs that are high-paying more difficult to obtain. If energy per capita falls, there may still be a reasonable number of jobs, but many of them won't pay well. High energy jobs such as building new schools and resurfacing roads tend to disappear, while jobs requiring little energy consumption, such as waitress and bartender, are added. 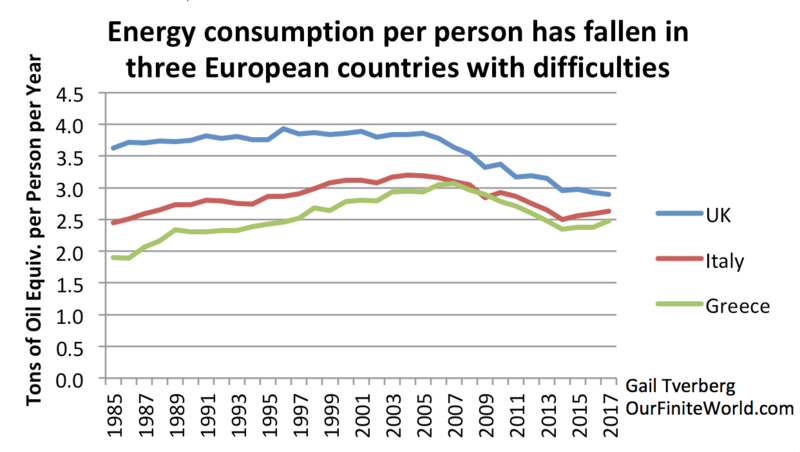 Figure 2 gives some examples of European countries that have seen declines in energy consumption per capita in recent years. 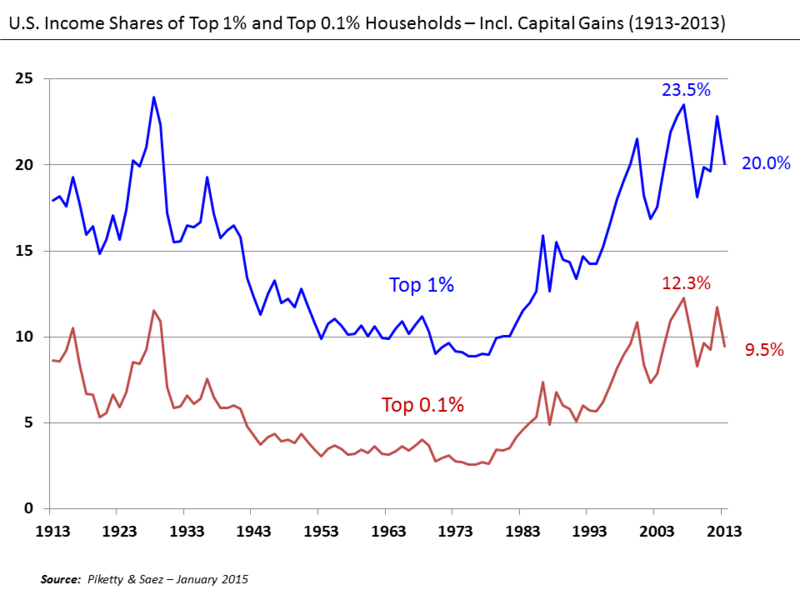 He likens the increasing share of wages/wealth going to the top to steam rising. 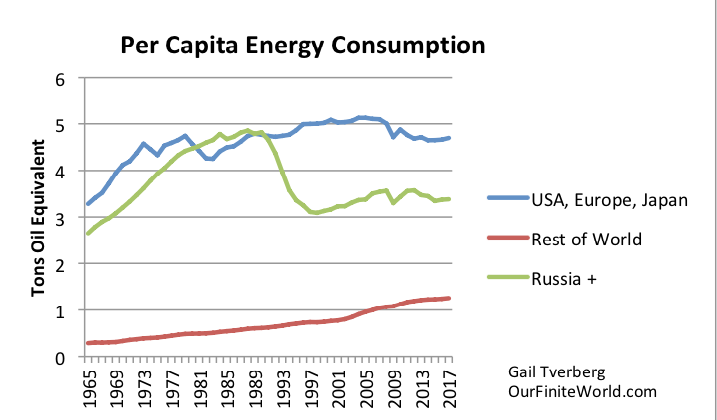 At the same time, he sees the falling share of energy consumption going to those at the bottom of the hierarchy as freezing out those who are contributing the least to the economy. Using this approach, some portion of the economy can be maintained in a temporary energy scarcity, even if the most vulnerable parts are lost. This wasn't the way it really worked, though, because customers couldn't afford the higher costs. 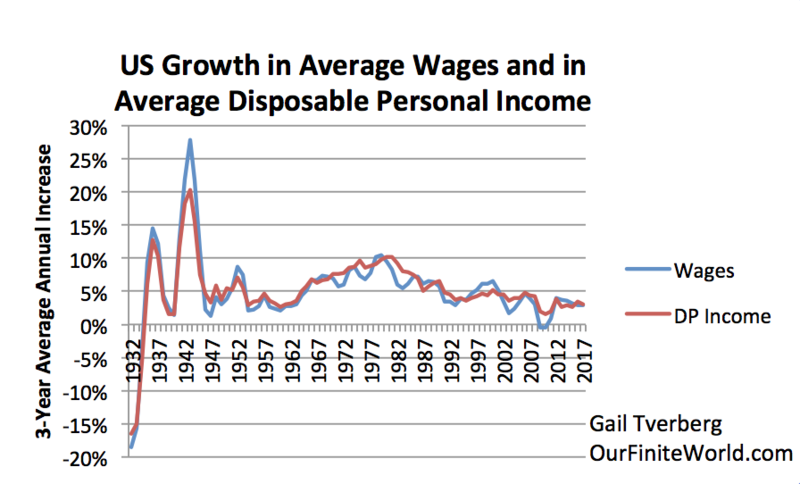 The wages of most citizens didn't rise because the amount of goods and services the economy could produce depended upon the quantity of coal that was produced and delivered. If the economy were to take workers from outside the coal industry to compensate for the industry's higher need for labor, it would further act to reduce the economy's total output, because the new coal workers would no longer be performing their previous jobs. 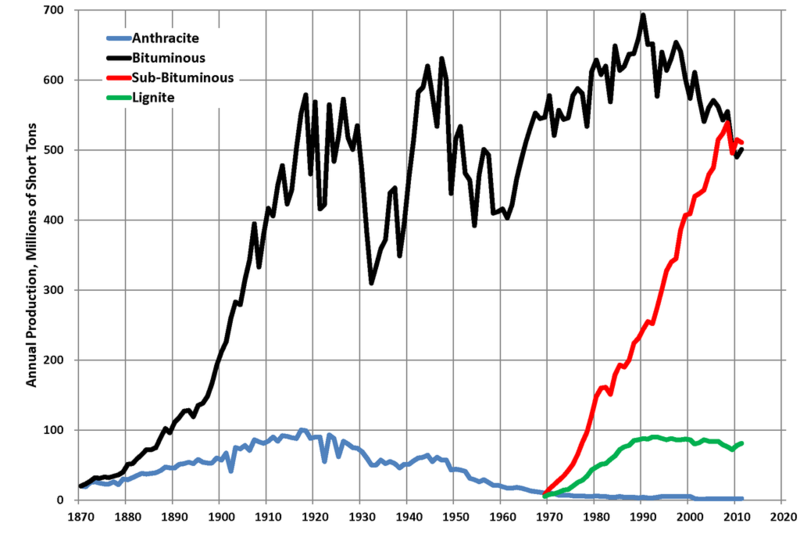 Mining companies (sort of) solved their wage problem by paying miners an increasingly inadequate wage. Strikes by workers and lockouts by employers became an increasing problem in the 1910 to 1914 period. Probably not coincidentally, World War I started in 1914. The war provided jobs for miners and others who could not otherwise find jobs that paid a living wage. The situation here seems to be more complex. The low energy problem that underlay World War I hadn't really been resolved; it had mostly been moved elsewhere. Also, Germany, which was the other major European coal producer besides the UK, was reaching a peak in its predominant type of coal production, hard coal (Figure 4). 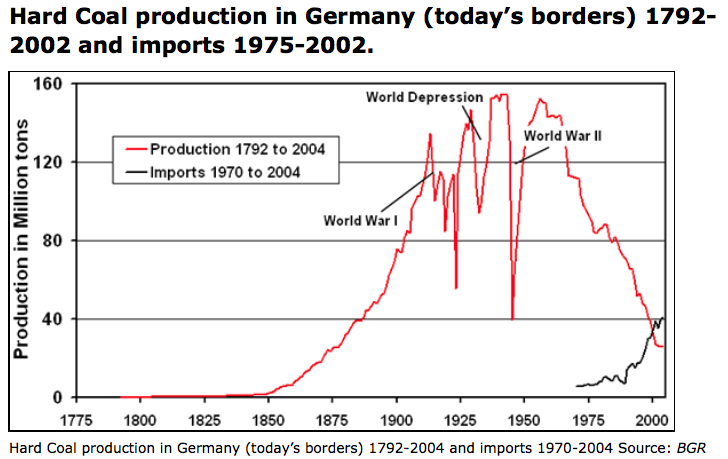 Because of the these issues, European demand for imported goods from the US dropped dramatically. In particular, the US had been a big supplier of food to Europe during World War I, but this source of demand disappeared after 1918, when soldiers returned to their fields. Regardless of where the extra costs come from, they don't actually produce more of the energy products that are essential to making the economy operate as it should. The higher costs are simply a drag on the economy, which must be hidden in some way. Approaches for hiding the problem include reducing interest rates, outsourcing manufacturing to low-wage countries, and replacing some unskilled workers with computers or robots. 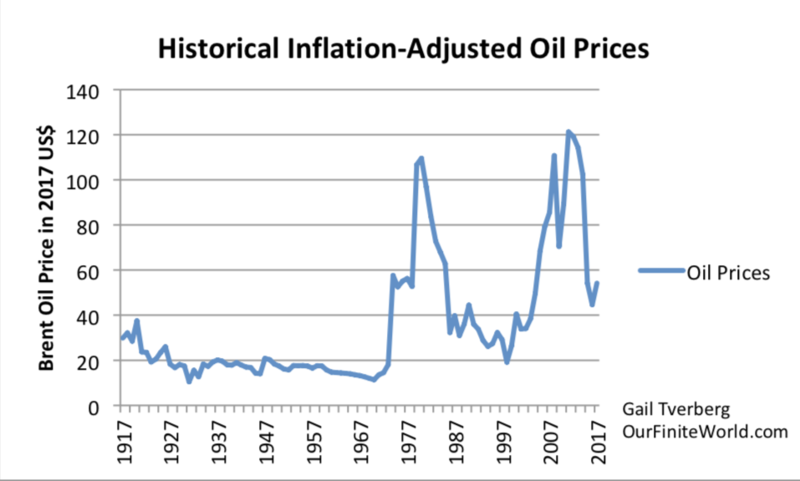 The more a person looks at the story of how rising oil prices might allow oil extraction indefinitely, the less reasonable it seems. 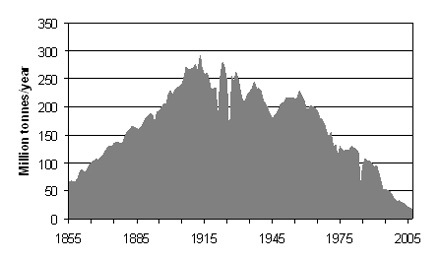 If the story about oil prices rising endlessly were true, we would have seen coal prices rise endlessly in Europe a century ago, when it was the dominant form of supplemental energy available. It didn't happen.